The edifice sits proudly on the south end of Red Square in Moscow, Russia. It may look like the architectural equivalent of "too many cooks spoil the broth", but the design succeeds. Even the floor plan is unusual. St Basil's Cathedral, not gigantic to begin with, houses nine distinct chapels. Each has its own uniquely shaped, hued and patterned dome. St Basil's Cathedral was built in the 1550's by Ivan the Terrible to commemorate his victory over the Tartars in Kazan in Central Asia. 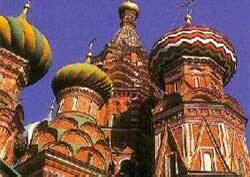 Originally, St Basil's Cathedral was white sided with gilded domes. The colorful patterns on the domes were not added until about a century after the cathedral was erected. Today, the building is a museum, no longer a house of worship. Regrettably, the interior of St Basil's Cathedral badly deteriorated. Some say the decline began in 1812 when Napoleon's cavalry lodged their horses within the cathedral. Others say it was the result of 20th century neglect. Fortunately, a project is currently afoot to restore the interior.